Youngevity™ Essential Life Sciences respects the privacy needs and concerns of our Associates and Customers. To earn your trust, we place great importance on how we handle any personal information, such as your name, email address, or phone number, that you provide via any of our Internet Web Sites (“Site”) or our Customer Service Call Center. This Statement describes the Personal Information we gather about you, what we do with it, the safeguards we have in place to protect it, and how you can control our use of it. To process transactions. Your information, whether public or private, will not be sold, exchanged, transferred, or given to any other company for any reason whatsoever, without your consent. To send periodic emails. We may periodically send marketing and promotional materials regarding new products, learning opportunities and special events. Note: If at any time you would like to unsubscribe from receiving future emails, we include detailed unsubscribe instructions at the bottom of each email. We offer the use of a secure server. All supplied sensitive/credit information is transmitted via Secure Socket Layer (SSL) technology and then encrypted into our Payment gateway providers database only to be accessible by those authorized with special access rights to such systems, and who are required to keep the information confidential. Introduction. Welcome to Snap2Finish.com by Youngevity International, Inc. wholly owned subsidiary of AL Global Corporation, d.b.a. Youngevity® (“S2F” or “Company”)! 1.2. Agreement.Company recommends that you read the following terms and conditions carefully. By accessing or using the S2F website, the S2F Service, including any software, plug-ins, mobile applications or merchandise made available by or purchased through S2F (together, the "Website" or "Service"), however accessed or used, you agree to be bound by these terms (the "Terms of Service" or the "Agreement"). We encourage you to print the Agreement or save it to your computer for reference. 1.5. Arbitration and RemediesThese terms contain a mandatory arbitration of disputes provision that requires the use of arbitration on an individual basis to resolve disputes, rather than jury trials or class actions, and also limits the remedies available to you in the event of a dispute. See Section 24 (Dispute Resolution) for full details. 4.1. By accessing and/or using the Service, including by doing so after accessing this Agreement, you represent and warrant that you are either (1) at least 18 years old, and are otherwise legally qualified to enter into and form contracts under applicable law or (2) between the ages of 13 and 18 and have submitted a signed parental and/or guardian consent form to S2F. 4.2. Corporate Use.If you are using the Service on behalf of a company, you further represent and warrant that you are authorized to act and enter into contracts on behalf of that company. Technology Platform. Without limitation, you agree that S2F is merely a technology platform, and that you use the Service at your own risk and pursuant to Section 9 (Assumption of Risk; Release). License. Subject to your compliance with these Terms of Service, S2F grants you a non-exclusive, non-sublicensable, revocable as stated in this Agreement, non-transferable license to access the Website, and to use the Service. No part of the Service, including the Website, may be reproduced, duplicated, copied, modified, sold, resold, distributed, transmitted, or otherwise exploited for any commercial purpose without the prior express written consent of S2F. All rights not expressly granted in this Agreement are reserved by S2F. Without limitation, this Agreement grants you no rights to the intellectual property of S2F or any other party, except as expressly stated in this Agreement. The license granted in this section is conditioned on your compliance with this Agreement. Your rights under this section will immediately terminate if, in the sole judgment of S2F, you have breached any provision of this Agreement. Software Updates. S2F reserves the right, in its sole discretion, to update, modify, or remove the features, functionality, or other aspects of its Website and Service at any time. No Reliance on Third Party Content.Opinions, advice, statements, or other information made available through the Service by third parties are those of their respective authors, and should not necessarily be relied upon. Those authors are solely responsible for their content. S2F does not: (i) guarantee the accuracy, completeness, or usefulness of any third-party information accessible on or through the Service; or (ii) adopt, endorse, or accept responsibility for the accuracy or reliability of any opinion, advice, or statement made by a third party through the Service. Under no circumstances will S2F be responsible for any loss or damage resulting from your reliance on information or other content posted through the Service transmitted to or by any third party. Assumption of Risk; Release.You knowingly and freely assume all risk when using the Service. You, on behalf of yourself, your personal representatives, and your heirs, voluntarily agree to release, waive, discharge, hold harmless, defend, and indemnify Company and its stockholders, officers, directors, employees, agents, affiliates, consultants, representatives, sublicensees, successors, and assigns (collectively, the "Company Parties") from any and all claims, actions, or losses for bodily injury, property damage, wrongful death, emotional distress, loss of privacy, or other damages or harm, whether to you or to third parties, that may result from your use of the Service. User Account, Accuracy, and Security. 10.1. User Account.To use the Service, you must register and create a user account ("Account"). During the Account creation process, you will be asked to provide information that personally identifies you ("Personal Information"). 10.2. Profile Viewable By Members.All users of the Service have Profiles, which include some of the Personal Information provided during Account registration. In some circumstances, such as a forum for users of the Service, these Profiles may be accessible by other members who have registered with the Service, created Accounts, and connected with each other. However, S2F cannot guarantee that the Personal Information in your Profile will remain private to registered users of the Service. 10.4. No Pseudonyms.You must use your real name on S2F; pseudonyms are not allowed. Any use of a pseudonym violates Section 10.3 (Account Information Accuracy) and is cause for suspension or deletion of your Account. 10.5. Account Security.You will also be asked to provide a username, password, and possibly other information to secure your Account. You are entirely responsible for maintaining the confidentiality of your password. You may not use the username or password of any other person, nor may you share your username and password, nor may you circumvent any authentication mechanism requiring the entry of usernames, passwords, or any other information to gain unauthorized access to the Service. You agree to notify S2F immediately of any unauthorized use of your Account. S2F shall not be liable for any loss that you incur because of someone else using your Account, either with or without your knowledge. You may be held liable for any losses incurred by S2F, its affiliates, officers, directors, employees, consultants, agents, and representatives due to someone else's use of your Account. Interactions with Other Users.Certain parts of the Website or Service may facilitate communication between S2F users, such as a blog, forum, reviews, or comments section. You are solely responsible for your interactions with other S2F users. You acknowledge and understand that S2F has not, and does not, in any way guarantee that it will: (a) screen its users; (b) inquire into the backgrounds of its users; or (c) review or verify the statements of its users. You agree to exercise reasonable caution in all interactions with other users, particularly if you decide to meet another user in person. S2F does not represent, warrant, endorse, or guarantee the conduct of its users. In no event shall S2F be liable for indirect, special, incidental, or consequential damages arising out of or relating to any user's conduct in connection with such user's use of the Service, including, without limitation, bodily injury, property damage, wrongful death, emotional distress, loss of privacy, or any other damages resulting from communications or meetings between users. Consent to Receive Electronic Communications from Company. By registering for the Service and providing your name, email, postal or residential address, and/or phone number through the Service, you expressly consent to receive electronic and other communications from S2F, over the short term and periodically, including email and short-message service ("SMS" or "text message") communications. These communications will be about the Service, new product offers, promotions, and other matters. You may opt out of receiving electronic communications at any time by following the unsubscribe instructions contained in each communication, or by sending an email to unsubscribe@snap2finish.com. You agree that these electronic communications satisfy any legal requirements that communications or notices to you be in writing. 13.1. Credit Card Information.If you wish to purchase any product or service made available through the Services (each such purchase, a "Transaction"), you may be asked to supply certain information relevant to your Transaction including, without limitation, your credit card number, the expiration date of your credit card, the 3-digit security code for your credit card, your billing address and your shipping information. YOU REPRESENT AND WARRANT THAT YOU HAVE THE LEGAL RIGHT TO USE ANY CREDIT CARD(S) OR OTHER PAYMENT METHOD(S) UTILIZED IN CONNECTION WITH ANY TRANSACTION. By submitting such information, you grant to Company the right to provide such information to third parties for purposes of facilitating the completion of Transactions initiated by you or on your behalf. Verification of information may be required prior to the acknowledgment or completion of any Transaction. 13.2. Reservation of Rights.Company reserves the right, with or without prior notice, to do any one or more of the following: (i) limit the available quantity of or discontinue any product or service; (ii) impose conditions on the honoring of any coupon, coupon code, promotional code or other similar promotion; (iii) bar any user from making or completing any or all Transaction(s); (iv) refuse to provide any user with any product or service; (v) change the fees and charges in effect, or to add new fees and charges, by posting such changes or providing notice to you. 13.3. Payment.You agree to pay all charges that may be incurred by you or on your behalf through the Site, at the price(s) in effect when such charges are incurred including, without limitation, all shipping and handling charges. In addition, you remain responsible for any taxes that may be applicable to your Transactions. 13.4. No Refunds or Exchanges.Due to the unique nature of each product created by you using the Service, and Company’s inability to resell the same, all fees and charges are nonrefundable. Subscriptions. From time to time, Company may make certain products and services available through the Service on a subscription-payment basis (each a "Subscription"). The terms of this Section 14 apply to any Subscriptions purchased by you. 14.1. Automatic Billing.If your Subscription plan provides for Automatic Billing, you understand and agree that Company will bill your Subscription fees automatically to the payment method (e.g., credit card) you designate when signing up. 14.2. Automatic Renewal.Unless you cancel your Subscription, your Subscription will renew automatically at the end of its term. For example, if your Subscription requires payment on the 1st day of every month, your credit card will continue to be charged every month according to your Subscription plan until you cancel your Subscription pursuant to Section 14.3 below. 14.3.2. Effect of Cancellation. Once your cancellation is confirmed by Company, your Subscription will be terminated. If your pre-cancellation billing period was paid up, then Company will not bill you further, but Company will not refund you for any remainder of that term. Third Party Websites.The Service may be linked with the websites of third parties ("Third Party Websites"), some of whom may have established relationships with S2F and some of whom may not. S2F does not have control over the content and performance of Third Party Websites. S2F has not reviewed, and cannot review or control, all of the material, including computer software or other goods or services, made available on Third Party Websites. Accordingly, S2F does not represent, warrant, or endorse any Third Party Websites, or the accuracy, currency, content, fitness, lawfulness, or quality of the information, material, goods, or services available through Third Party Websites. S2F disclaims, and you agree to assume, all responsibility and liability for any damages or other harm, whether to you or to third parties, resulting from your use of Third Party Websites. 16.1. User Content Defined. "User Content" is any content, material, or information, not including personally identifiable information (e.g., first and last name, address, phone number, email address, etc. ), that you submit, upload, and/or post to, or transmit, display, perform, or distribute through the Service, whether in connection with your use of the Service or otherwise. This includes, without limitation, personal photos, videos, images, or illustrations uploaded by you for use on any product purchased through the Service. 16.2. You Own Your User Content.S2F does not claim ownership of any User Content. You retain all right, title, and interest, including without limitation all worldwide intellectual property rights, in and to your User Content. As such, S2F requires the following license from you to, for example, authorize S2F to apply your photos, images, and other content to products purchased through the Service. 16.3. License of User Content.By submitting, uploading, or posting User Content in any form with, through, or to the Service, you grant the Company Parties a royalty-free, perpetual, non-exclusive, unrestricted, fully paid-up, worldwide, sublicensable, revocable (as set forth in Section 6 (License) of this Agreement), assignable license to copy or otherwise reproduce, modify, adapt, translate, distribute, enhance, transmit, publicly display or perform, reformat, and/or otherwise use User Content in connection with the operation of the Service, or any other similar or related business, in any medium now existing or later devised, including without limitation in advertising and publicity. You further agree that the Company Parties may publish or otherwise disclose your personal information in connection with their exercise of the license granted under this section. You agree to waive, and waive, any claims arising from or relating to the exercise by the Company Parties of the rights granted under this section, including without limitation any claims relating to your rights of personal privacy and publicity. You will not be compensated for any exercise of the license granted under this section. 16.4. Your Representations About User Content.You represent and warrant that you: (a) own all rights, title, and interest in and to all User Content you submit, or are otherwise authorized to grant the rights provided the Company Parties under this section; or (b) have written consent, release, and/or permission of every identifiable individual person in any User Content you submit to use the name and likeness of every identifiable person in the User Content. You agree that you will not submit any User Content that does not fully comply with S2F's prohibitions against Objectionable Content, as detailed in Section 18 (Objectionable Content). 16.5. Company's Right to Reject User Content.S2F reserves the right, in its sole discretion, to reject any User Content for any reason. The categories specified in Section 18 (Objectionable Content) and Section 19 (Prohibited Uses) are not exhaustive lists of content that S2F reserves the right to remove or deny. Your Responsibility for Defamatory Comments. 17.1. You agree and understand that you may be held legally responsible for damages suffered by other users or third parties as the result of your remarks, information, feedback, or other content posted or made available through the Service that is deemed defamatory or otherwise legally actionable. Under Section 230 of the Federal Communications Decency Act of 1996, S2F is not legally responsible, nor can it be held liable for damages of any kind, arising out of or in connection to any defamatory or otherwise legally actionable remarks, information, feedback, or other content posted or made available through the Service. 17.2. If you raise or file any claim against S2F for conduct that a Court of Competent Jurisdiction later finds to constitute an "exercise of a publisher's traditional editorial functions," or the legal equivalent, you agree to fully and immediately compensate S2F for all losses, liability, damages, costs, and expenses, including without limitation all attorneys' fees and expenses in defending the action and resolving the matter. If you fail to compensate S2F for any such claim, you agree and authorize S2F to report your Personal Information, including without limitation your unpaid claim, to consumer credit reporting services, collection agencies, and others. 19.15. paying anyone for interactions on the Service. 20.1.1. You represent and warrant that, when using the Service, you will obey all applicable laws and respect the intellectual property rights of others. Your use of the Service is at all times governed by and subject to copyright and other intellectual property laws. You agree not to upload, post, transmit, display, perform, or distribute any content, information, or other materials in violation of any third party's copyrights, trademarks, or other intellectual property or proprietary rights. 20.1.2. You represent and warrant that you are the sole and exclusive owner of any User Content that you submit through the Service. You shall be solely responsible for any violations of any laws and for any infringements of third-party rights caused by your use of the Service. S2F users bear the sole burden of proving that content, information, or other materials do not violate any laws or third-party rights. 20.2. Trademarks.S2F, Snap2Finish, and the associated logos (collectively, the "Company Marks") are trademarks or registered trademarks of S2F. Other trademarks, service marks, graphics, logos, and domain names appearing anywhere on, through, or in connection with the Service may be the trademarks of third parties. Neither your use of the Service nor this Agreement grant you any right, title, or interest in, or any license to reproduce or otherwise use, the Company Marks or any third-party trademarks, service marks, graphics, logos, or domain names. You agree that any goodwill in the Company Marks generated as a result of your use of the Service will inure to the benefit of S2F, and you agree to assign, and do assign, all such goodwill to S2F. You shall not at any time, nor shall you assist others to, challenge S2F's right, title, or interest in, or the validity of, the Company Marks. 20.3. Copyrighted Materials; Copyright Notice.All content and other materials available through the Service, including without limitation the S2F logo, design, text, graphics, and other files, and their selection, arrangement, and organization, are either owned by S2F or are the property of S2F's licensors and suppliers. Except as explicitly provided, neither your use of the Service nor this Agreement grant you any right, title, or interest in any such materials. 20.4.1. As S2F asks others to respect S2F's intellectual property rights, S2F respects the intellectual property rights of others. S2F follows the notice and takedown procedures in the Digital Millennium Copyright Act ("DMCA"). 20.4.2. If you believe content located on or linked to by the Service violates your copyright, please immediately notify S2F by emailed DMCA takedown notice ("Infringement Notice"), providing the information described below. If S2F takes action in response to an Infringement Notice, it will make a good faith attempt to contact the party who made the content available at the most recent email address that party provided to S2F. 20.4.3. Under the DMCA, you may be held liable for damages based on material misrepresentations in your Infringement Notice. You must also make a good-faith evaluation of whether the use of your content is a fair use; fair uses are not infringing. (See 17 U.S.C. Section 107, available at https://www.law.cornell.edu/uscode/text/17/107, and Lenz v. Universal Music Corp., No. 13-16106 (9th Cir. Sep. 14, 2015), available at https://www.courtlistener.com/opinion/2937139/stephanie-lenz-v-universal-music-corp/.) If you are not sure if content located on or linked to by the Service infringes your copyright, you should first contact an attorney. A statement by you: (i) that you believe in good faith that the use of the material that you claim to infringe your copyright is not authorized by law, or by the copyright owner or such owner's agent; and, (ii) under penalty of perjury, that all of the information contained in your Infringement Notice is accurate, and that you are either the copyright owner or a person authorized to act on their behalf. 20.4.5. Infringement Notices should be sent to copyright@snap2finish.com with the subject line "DMCA Notice: (INSERT YOUR NAME OR YOUR COMPANY'S NAME)". 20.4.6. S2F will respond to all DMCA-compliant Infringement Notices, including, as required or appropriate, by removing the offending material or disabling all links to the offending material. 20.4.7.Disclosure. All received Infringement Notices may be posted in full to the Lumen database (https://lumendatabase.org/), previously known as the Chilling Effects Clearinghouse. 21.1. No Warranties.S2F, on behalf of itself and its licensors and suppliers, expressly disclaims any and all warranties, express or implied, regarding the Service, arising by operation of law or otherwise, including without limitation any and all implied warranties of merchantability, fitness for a particular purpose, non-infringement, no encumbrance, or title, in addition to any warranties arising from a course of dealing, usage, or trade practice. Neither S2F nor its licensors or suppliers warrants that the Service will meet your requirements, or that the operation of the Service will be uninterrupted or error-free. S2F disclaims all implied liability for damages arising out of the furnishing of the Service pursuant to this Agreement, including without limitation, mistakes, omissions, interruptions, delays, tortious conduct, errors, representations, or other defects arising out of the failure to the furnish the Service, whether caused by acts of commission or omission, or any other damage occurring. S2F shall not be liable for any indirect, incidental, special, consequential, or punitive damages (including without limitation damages for lost profits or lost revenues), whether caused by the acts or omissions of S2F, Company Parties, or S2F users, or their agents or representatives. 21.2. Your Responsibility for Loss or Damage; Backup of Data. .
21.2.1.You agree that your use of the Service is at your sole risk. You will not hold S2F or its licensors and suppliers, as applicable, responsible for any loss or damage that results from your access to and/or use of the Service, including without limitation any loss or damage to any of your computers, mobile devices, including without limitations tablets and/or smartphones, or data. The Service may contain bugs, errors, problems, or other limitations. 21.2.2.Importantly, you acknowledge that a catastrophic disk failure or other similar event could result in the loss of all of the data related to your account. You agree and understand that it is your responsibility to backup your data to your personal computer or external storage device and to ensure such backups are secure. 21.3. Limitation of LiabilityIn no event shall S2F or its licensors or suppliers be liable to you for any claims arising from your use with the Service, including without limitation for special, incidental, or consequential damages, lost profits, lost data or confidential or other information, loss of privacy, costs of procurement of substitute goods or services, failure to meet any duty including without limitation of good faith or of reasonable care, negligence, or otherwise, regardless of the foreseeability of those damages or of any advice or notice given to S2F or its licensors and suppliers arising out of or in connection with your use of the Service. This limitation shall apply regardless of whether the damages arise out of breach of contract, tort, or any other legal theory or form of action. You agree that this limitation of liability represents a reasonable allocation of risk and is a fundamental element of the basis of the bargain between S2F and you. The Service would not be provided without such limitations. 21.4. Application of DisclaimersThe above disclaimers, waivers, and limitations do not in any way limit any other disclaimer of warranties or any other limitation of liability in any other agreement between you and S2F or between you and any of S2F's licensors and suppliers. Some jurisdictions may not allow the exclusion of certain implied warranties or the limitation of certain damages, so some of the above disclaimers, waivers, and limitations of liability may not apply to you. S2F's licensors and suppliers are intended third-party beneficiaries of these disclaimers, waivers, and limitations. No advice or information, whether oral or written, obtained by you through the Service or otherwise shall alter any of the disclaimers or limitations stated in this section. Your Representations and Warranties.You represent and warrant that your use of the Service will be in accordance with this Agreement and any other S2F policies, and with any applicable laws or regulations. 23.1. Without limiting any indemnification provision of this Agreement, you (the "Indemnitor") agree to defend, indemnify, and hold harmless S2F and the Company Parties (collectively, the "Indemnitees") from and against any and all claims, actions, demands, causes of action, and other proceedings (individually, "Claim", and collectively, "Claims"), including but not limited to legal costs and fees, and providing sole and exclusive control of the defense of any action to S2F, including the choice of legal counsel and all related settlement negotiations, arising out of or relating to: (i) the relationship between you and S2F, whether based in contract, tort, statute, fraud, misrepresentation, or any other legal theory; (ii) your breach of this Agreement, including without limitation any representation or warranty contained in this Agreement; (iii) your access to or use of the Service; (iv) your provision to S2F or any of the Indemnitees of information or other data; (v) your violation or alleged violation of any foreign or domestic, international, federal, state, or local law or regulation; or (vi) your violation or alleged violation of any third party's copyrights, trademarks, or other intellectual property or proprietary rights. 23.2. The Indemnitees each have the individual right, but not the obligation, to participate through counsel of their choice in any defense by you of any Claim as to which you are required to defend, indemnify, or hold harmless any, each, and/or all Indemnitees. You may not settle any Claim without the prior written consent of the concerned Company Parties. 23.3. Without limitation, the Indemnitor also agrees to compensate S2F for any and all lost revenues, future lost profits, reasonable search costs, and any other reasonable expenses resulting from any Indemnitor violation of Section 19 (Prohibited Uses), including without limitation any suspension of affiliate accounts or affiliate payment attributable to fraudulent efforts to manipulate or otherwise modify reported impressions generated by the Company Parties under any affiliate advertising agreement. 24.1.1. If you and S2F cannot resolve a Claim through negotiations, either party may elect to have the Claim finally and exclusively resolved by binding arbitration. Any election to arbitrate by one party shall be final and binding on the other(s). 24.1.2. If you and S2F cannot resolve a Claim through negotiations, either party may elect to have the Claim finally and exclusively resolved by binding arbitration. Any election to arbitrate by one party shall be final and binding on the other(s). 24.1.3. The language in this Agreement shall be interpreted in accordance with its fair meaning and not strictly for or against either party. 24.1.4. The arbitration shall be commenced and conducted under the Commercial Arbitration Rules of the American Arbitration Association ("AAA"), as modified by this Agreement, available at the AAA website www.adr.org or by calling the AAA at 1-800-778-7879. Except as otherwise provided for in this Agreement, S2F will pay the AAA filing, administration, and arbitrator fees. If, however, the arbitrator finds that either the substance of your claim or the relief sought is frivolous or brought for an improper purpose (as measured by the standards set forth in Federal Rule of Civil Procedure 11(b)), then you will pay the arbitrator fees, in addition to any amount that exceeds the filing fees. In that case, you also agree to reimburse S2F for all payments disbursed that are your obligation to reimburse under the AAA Rules. The arbitrator is bound by the terms of this Agreement. All issues are for the arbitrator to resolve, except that issues relating to the enforceability of the arbitration provision are for a Court of Competent Jurisdiction to resolve. The arbitration may be conducted in person, through document submission, through telephone, or online. The arbitrator will issue a decision in writing, but need only provide a statement of reasons if requested by a party. The arbitrator must follow applicable law, and any award may be challenged if the arbitrator fails to do so. S2F may litigate to compel arbitration in court, to stay proceedings pending arbitration, or to modify, confirm, vacate, or enter judgment on the award entered by the arbitrator. The arbitrator shall award costs to the prevailing party (including, without limitation, fees, expenses, and reasonable attorneys' fees) at any time during the proceeding and upon request from either party, within 14 days of the arbitrator's ruling on the merits. 24.2. Restrictions Against Joinder of Claims. 24.2.1. You and S2F agree that any arbitration shall be limited to each Claim individually. You and S2F agree that each may only bring claims against the other in your or S2F's individual capacity and not as a plaintiff or class member in any purported class or representative proceeding. 24.2.2. If this specific provision is found to be unenforceable in a Court of Competent Jurisdiction, the Claim will still be finally and exclusively resolved by binding arbitration upon the election of either party, and any election to arbitrate by one party shall be final and binding on the other(s). In addition: (1) no arbitration shall be joined with any other arbitration, and (2) there is no right for any Claim to be arbitrated on a class-action basis or to employ class action procedures, and (3) there is no right of authority for any dispute to be brought in a purported representative capacity on behalf either of the general public or any other individuals. 24.3. Remedies in Aid of Arbitration; Equitable Relief.This agreement to arbitrate will not preclude you or S2F from seeking provisional remedies in aid of arbitration, including without limitation orders to stay a court action, compel arbitration, or confirm an arbitral award, from a Court of Competent Jurisdiction. Furthermore, this agreement to arbitrate will not preclude you or S2F from applying to a Court of Competent Jurisdiction for a temporary restraining order, preliminary injunction, or other interim or conservatory relief, as necessary. "Court of Competent Jurisdiction" means any federal or state court: (1) that has jurisdiction over the subject matter; and (2) that is located in the State of California. 24.4. Venue for any Judicial Proceeding. 24.4.1.This Agreement, including without limitation this Agreement's interpretation, shall be treated as though this Agreement were executed and performed in the State of California, and shall be governed by and construed in accordance with the laws of the State of California without regard to its conflict of law principles. The language in this Agreement shall be interpreted in accordance with its fair meaning and not strictly for or against either party. 24.4.2. The proper venue for any judicial action arising out of, relating to, or in connection with this Agreement will be the state and federal courts located in or nearest to San Diego, California. The parties stipulate to, and agree to waive any objection to, the personal jurisdiction and venue of such courts, and further expressly submit to extraterritorial service of process. 25.1. By Company.Without limiting any other provision of this Agreement, S2F reserves the right to, in S2F's sole discretion and without notice or liability, deny use of the Service to any person for any reason or for no reason at all, including without limitation for any breach or suspected breach of any representation, warranty, or covenant contained in this Agreement, or of any applicable law or regulation. 25.2. Automatic Termination Upon Breach by You.This Agreement shall automatically terminate if you breach any of this Agreement's representations, warranties, or covenants. Such termination shall be automatic, and shall not require any action by S2F. 25.3. By You.You may terminate this Agreement and your rights under it at any time, for any or no reason at all, by providing to S2F notice of your intention to do so, in the manner required by Section 26 (Notices). 25.4.1.TAny termination of this Agreement automatically terminates all rights and licenses granted to you under this Agreement, including all rights to use the Service. Upon termination, S2F may, but has no obligation to, in S2F's sole discretion, rescind any services and/or delete from S2F's systems all your Personal Information and any other files or information that you made available to S2F or that otherwise relate to your use of the Service. Upon termination, you shall cease any use of the Service. 25.4.2.After termination, S2F reserves the right to exercise whatever means it deems necessary to prevent your unauthorized use of the Service, including without limitation technological barriers such as IP blocking and direct contact with your Internet Service Provider. 25.5. Legal Action.If S2F, in S2F's discretion, takes legal action against you in connection with any actual or suspected breach of this Agreement, S2F will be entitled to recover from you as part of such legal action, and you agree to pay, S2F's reasonable costs and attorneys' fees incurred as a result of such legal action. The Company Parties will have no legal obligation or other liability to you or to any third party arising out of or relating to any termination of this Agreement. Notices. All notices required or permitted to be given under this Agreement must be in writing. 26.1. S2F shall give any notice by email sent to the most recent email address, if any, provided by the intended recipient to S2F. You agree that any notice received from S2F electronically satisfies any legal requirement that such notice be in writing. 26.2. You bear the sole responsibility of ensuring that your email address on file with S2F is accurate and current, and notice to you shall be deemed effective upon the sending by S2F of an email to that address. 26.3. You shall give any notice to S2F by email to notices@snap2finish.com. 27.1. Entire Agreement.This Agreement constitutes the entire agreement between S2F and you concerning your use of the Service. 27.2. Partial Invalidity.Should any part of this Agreement be declared invalid, void, or unenforceable by a Court of Competent Jurisdiction, such decision shall not affect the validity of any remaining portion of this Agreement, which shall remain in full force and effect, and the parties acknowledge and agree that they would have executed the remaining portion without including the part so declared by a Court of Competent Jurisdiction to be invalid, void, or unenforceable. 27.3. Amendments.This Agreement may only be modified by a written amendment signed by an authorized executive of S2F, or by the unilateral amendment of this Agreement by S2F along with the posting by S2F of that amended version. 27.4. No Waiver.A waiver by either party of any term or condition of this Agreement, or any breach, in any one instance, will not waive that term or condition or any later breach. 27.5. Assignment.This Agreement and all of your rights and obligations under it will not be assignable or transferable by you without the prior written consent of S2F. This Agreement will be binding upon and will inure to the benefit of the parties, their successors, and permitted assigns. 27.6. Independent Contractors.You and S2F are independent contractors, and no agency, partnership, joint venture, or employee-employer relationship is intended or created by this Agreement. 27.7. No Third Party Beneficiaries.here are no third-party beneficiaries to this Agreement, with the following exceptions: the Company Parties; S2F's licensors and suppliers (to the extent expressly stated in this Agreement); and to the extent stated in the following Sections: Section 8 (No Reliance on Third Party Content), Section 15 (Third Party Websites), and Section 21.4 (Application of Disclaimers). 27.8. Injunctive Relief.You acknowledge and agree that any actual or threatened breach of this Agreement or infringement of proprietary or other third-party rights by you would cause irreparable injury to S2F and S2F's licensors and suppliers, and would therefore entitle S2F or S2F's licensors or suppliers, as the case may be, to injunctive relief. 27.9. Headings.The headings in this Agreement are for convenience only, and shall have no legal or contractual effect. We work very hard to provide the best quality service to our customers and distributors. If you have a question and would like to speak to a representative please contact us. Snap2Finish orders are shipped to the continental United States, Alaska, Hawaii, Puerto Rico, British Virgin Islands, United States Virgin Islands, APO/FPO/PPO addresses. If you’d like to know whether Snap2Finish can ship to your location, please email S2Fsupport@youngevity.com. Most orders begin the order process as soon as your online purchase is completed. Your order will be shipped once the items are produced and ready for shipping. As soon as your order is shipped, you will be notified by email (if you have provided a valid email address within your order). Please note that business days are Monday to Friday, excluding federal holidays within the United States. After your order leaves our warehouse, delivery times vary according to the location of your shipping address and service used. At checkout, you will be prompted to choose a shipping method for your item(s). There are sometimes exceptions to these rules which may require additional day(s) to process. Should you have any questions about your order, please feel free to call customer service and have your order ID available. Orders with shipping destinations in Alaska or Hawaii may require 2-3 additional business days for delivery. Delivery service is always U.S. Postal Service. Orders shipping to an APO/FPO/PPO military address or a Post Office box may only be shipped via Ground delivery (through U.S. Postal Service) and cannot be expedited. Business days are Monday-Friday, excluding federal holidays within the United States. When you enter your billing address details during the checkout process, you will be given the option to enter a different delivery address in the same country. Please note that we reserve the right to contact you for further information, if you give a different delivery address to the billing address. When placing an order for Canada or other international countries, it is imperative to add a proper phone number to the ship to address especially if it is different from the billing address. Fed Ex is the service we use. If an order processes without this proper information, your order will be delayed from shipping. If you are not available to receive your delivery, the carrier will leave a contact card at your address saying when they will attempt to re-deliver the package. If on the third attempt at delivery you are not in to receive the parcel, it will be returned to the carrier depot. You will need to contact the shipping provider directly to make arrangements for the collection. If you don’t collect it or arrange re-delivery, the parcel may be subject to return to Youngevity. We stand behind the quality of our products and guarantee them against any defects in manufacturing one hundred percent. Upon receiving that email we will be in contact with you as we assess why the error occurred to ensure that reprinting it will not cause the error to happen again. If there is a user error, you can still reorder your product! We offer a 75% discount within 30 days of the original order date. Can I change or cancel my order once I've submitted it ? Orders are submitted to printing within an hour after they are submitted. Thus, no changes can be made to an order after that time. What payment options are available ? Youngevity accepts Visa, MasterCard, American Express and Discover. All prices are listed and payments processed in US dollars. Can I reorder a project I have already ordered ? Yes. Go into your account, my orders and locate the order that contains the item you wish to re-order. Once you locate the order, within the order detail you will see a re-order link. Click on the link and it will take you into the edit project process. Will I receive an order confirmation ? Yes, once you submit your order you will receive an email confirming your order has been submitted. I received my order and it is damaged, who do I contact ? Will there be more questions coming soon ? Yes, more answers will be coming soon. How are delivery costs calculated ? Delivery costs are calculated by the shipping method you select at the time of order, the weight of the package and zip code it is being shipped to. What delivery options are available ? How long will it take me to receive my order ? This depends on the products you are ordering and method of shipping you select at check out. Please visit our SHIPPING INFO tab on the left column for further details. Why was my order delivered in multiple packages ? Depending upon the products you order you may receive you order in multiple packages. Select products have different production times and to assure you are receiving your items as soon as possible we will ship when they are complete. There is no additional charge to you for this service. How is my order packaged ? Orders will arrive in an evelope, box or bag depending upon the size and shape of the item. Can I return an order if I don't like it ? If there is a printing or shipping defect, we would be happy to send a replacement. We do not accept returns. How do I save my project and how do I know it saved ? To save a project, click on the disk icon. When it has successfully saved, a checkmark briefly appears before displaying the disk icon again. How long will my projects be saved within my account ? Projects are stored as long as your account remains active. An active account is defined as one that has placed an order in the past 12 months. Where do I find the projects I've started, but are not finished ? To find your Pending Projects, click on the gear icon at the top and then select Pending Projects. Are there bleeds on projects? Yes, each project has bleeds built into them, even though they are not displayed. Make sure that your photo or background goes slightly past the edge of the project. If you click on a photo or background in a template that you have not modified, you'll see that the selection box is larger than the project you are working on..
What is the price for photo prints? How long are my photos stored within my account ? Photos are stored as long as your account remains active. An active account is defined as one that has placed an order in the past 12 months. How many photos can I upload ? There are no restrictions on the number of photos you can upload into your account. Can I use photos from my Facebook account ? Yes, you have the option to import your photos from Facebook when selecting photos to use in your projects or when uploading into your photo albums. Please note, photos uploaded to Facebook are resized for storage, thus when you import to use on a Snap2Finish project, the photo may not have sufficient resolution to provide a high quality print when using a larger template. Can I use photos from my Instagram account ? Can I use photos from my iCloud account ? Yes, you have the option to import your photos from the device you are using Snap2Finish on. Select " My Device " and then select your iCloud drive. How do I import photos from phone ? 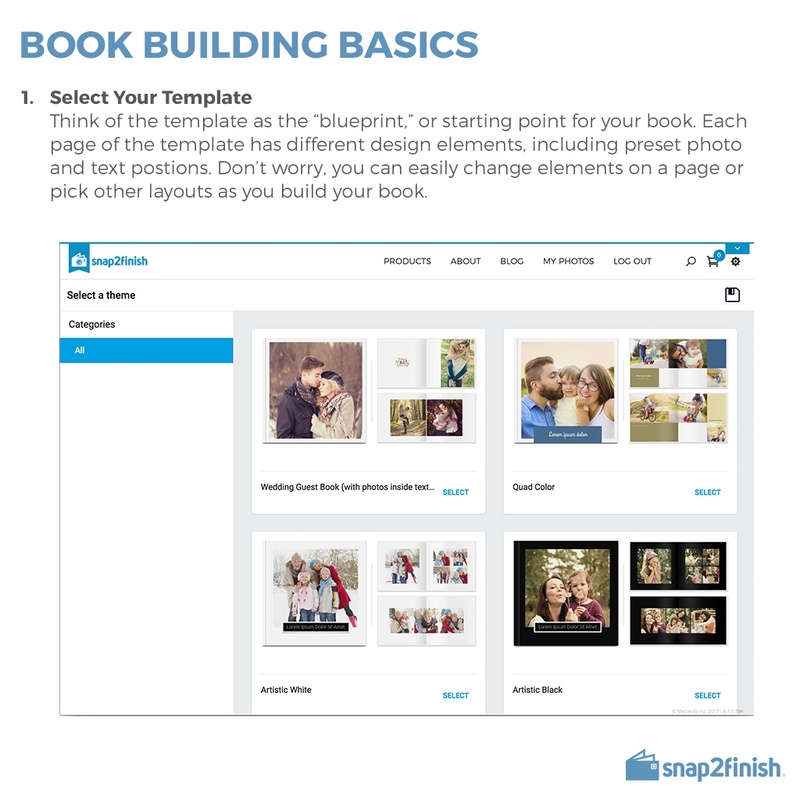 Yes, you have the option to import your photos from the device you are using Snap2Finish on. Select " My Device " and then select your phone. How do I import photos from my computer ? Select " My Device " when prompted to Choose your photos, then select the images on your computer you wish to upload. 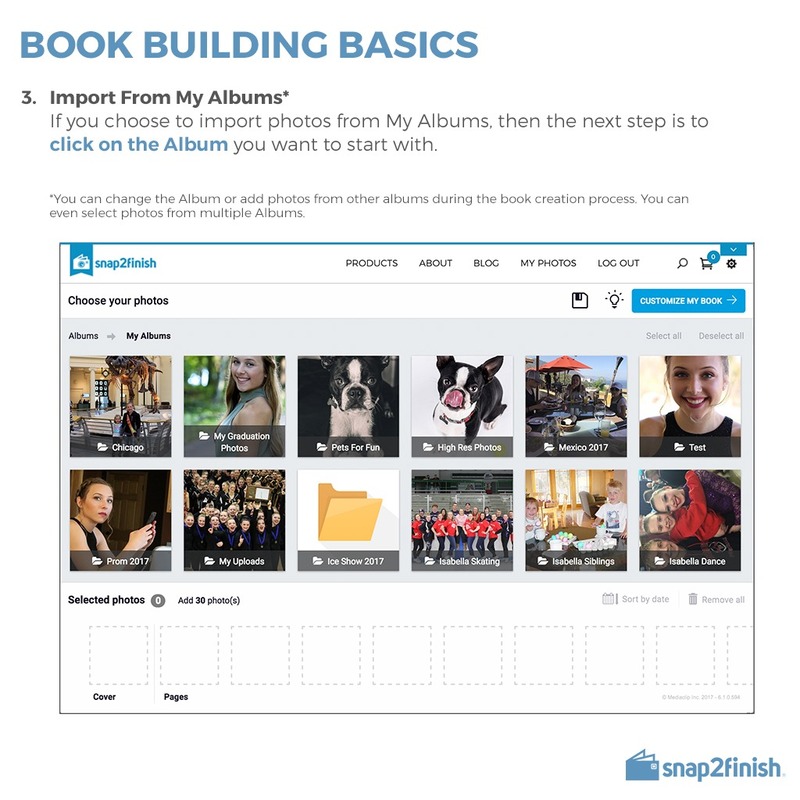 If you upload your photos into "My Albums" you will have the option to use the custom SnapEditor. This editor provides quick fixes as well as many custom editing tools utilizing " Perfectly Clear " technologies. What are the recommended photo resolutions for photos? The photo resolution required for a photo depends on the product you are creating and the final size the photo will be printed. Our system checks the photo when it is added to the project to determine if it meets the minimum required resolution to produce a quality image for that size photo. If the photo does not meet this minimum you will be provided a warning that the photo does not meet that minimum resolution and you should consider using a different photo. Can I upload photos from Dropbox? If you've connected your Dropbox account to your computer's drive, then you can upload using "My Device". If not, you'll need to download your photos from Dropbox to you computer and then upload to your album. Can you move a photo from one album to another album? Yes. Change to Edit Mode for the album. Then select the photo to move and select move from the options at the top of the screen. Can you download edited photos to use in Heritage Makers? Yes. 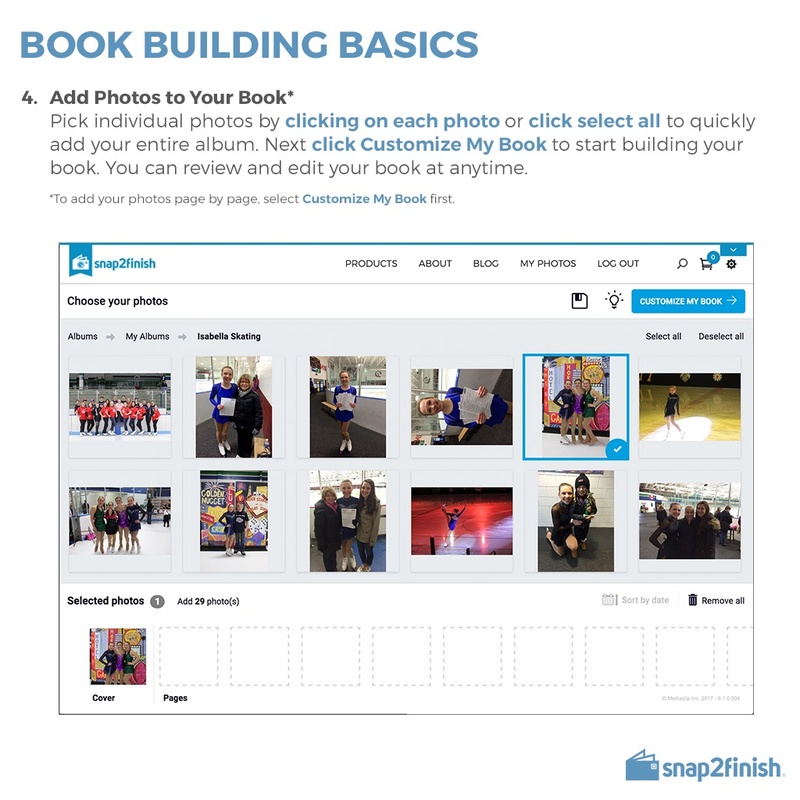 Any photo in a Snap2Finish album can be downloaded. Does Snap2Finish connect with or talk to Heritage Makers to access photos stored there? Not at this time. We are looking at that for a future release. Will there be new product released over time ? Yes, new products will be added periodically throughout the year so check back often. Can I put a designed page from one project into another project without having to redo the entire thing ? No, you are not able to insert pages from one page to another between different projects. Is there an app for my phone or tablet? Snap2Finish is a browser app, which means you can use it from any device that supports internet browsers. To use Snap2Finish, launch your browser and go to www.Snap2Finish.com. You'll notice that it is mobile friendly so you can easily create projects on the go. How can I earn money with Snap2Finish? When you have a new customer that wants to make a project in Snap2Finish, give them your Youngevity Associate/Distributor ID to use when they create an account. This ensures that their order is credited to you. When they place an order, you’ll receive 10% of the sale plus BV. When associates/distributors order, they earn BV and QV on their orders and payments to their upline are the same as for other Youngevity products. How do I change my password? ? Select the Forgot Password link below the login area and you will be taken to a Password Reset page. Enter your email address or username and you will receive an email with a link to reset your password. What do I use to log in? If you are a Youngevity Associate or Youngevity Preferred Customer, use your Youngevity ID and password (the same ones used to access your Youngevity Back Office). If you do not have a Youngevity ID, you can create a Retail Customer account for Snap2Finish. How do I create a Youngevity account? At this time, to create a Youngevity account you'll need to go to www.Youngevity.com and create an account.. I created a Snap2Finish account but I already have a Youngevity account. 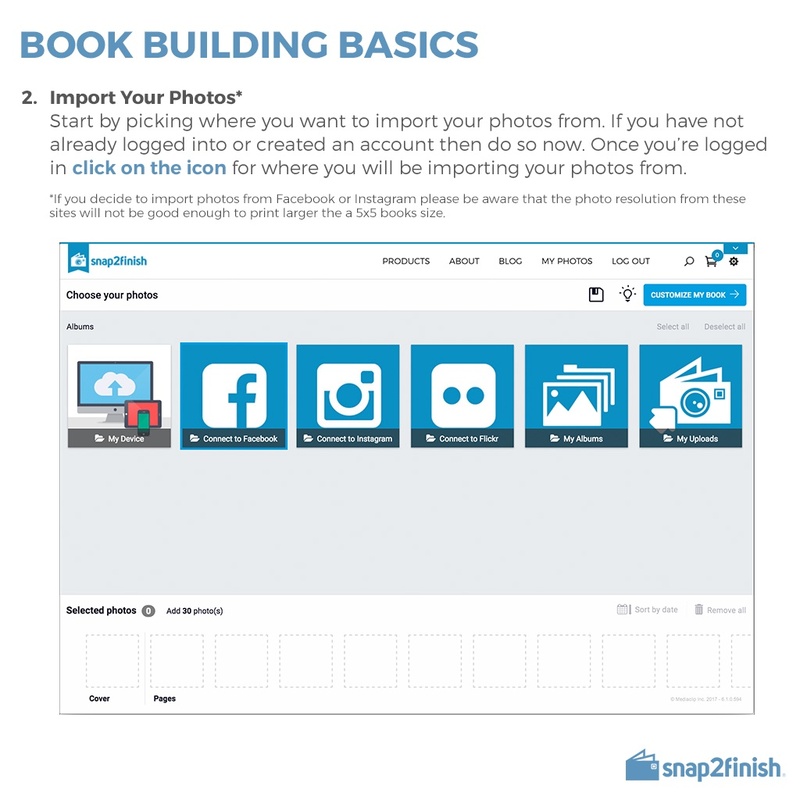 How do I access my projects and photos in my Snap2Finish account? You'll need to call customer service at 1-866-694-3763 to help you merge the accounts. They are available Monday through Friday between 9:00 am and 5:00 pm MT. What is the difference between a Retail Customer and a Preferred Customer? Preferred Customers have a Youngevity ID and receive wholesale pricing when ordering from Snap2Finish. Retail Customers have a Snap2Finish account and not a Youngevity ID. Retail Customers pay retail pricing when ordering from Snap2Finish. What are the cover choices ? We currently offer the option of a Hard Cover or Soft Cover photo book. Can I print on the inside of the cover ? Is it possible to receive a book sample before I order ? We do not offer sample books at this time. How will my photobooks be packed, shipped and delivered ? Your books are wrapped in a protective wrapping and then inserted into a shipping box. Are customizations possible such as foil stamping and embossing ? Foil stamping and embossing customizations are not available at this time. How long does it take to arrive ? This depends upon the book you select to create, the geographic location it is shipping to and method of delivery you select at checkout. Generally it will take 7-10 business days. Are there any restrictions on the type of images I can upload ? Please refer to item 16, User Content within our Terms and Services for details around the images allowed. Do the colors fade over time ? Colors may fade over time depending upon the enviroment the book is being stored in. To reduce the possiblity of fading overtime do not store in direct sunlight. What are the specifications for the Superia Layflat books from Fuji? Pages are attached together back to back with hot melt. Overleaf glued to cover. Interior pages printed on Fujicolor Crystal Archive Album HD Paper. Additional protection layer; surface is more resistant to fingerprints and stickiness. Higher resistance against all humidity conditions due to the protective layer. Extra vivid color reproduction, wide color range. Layflat binding for stunning, full-page spreads. Custom printed and laminated cover. What is the maximum number of pages in a book? Maximum number of pages varies by book type and size. When you select a book to create the minimum and maximum page numbers are displayed. What size formats are available ? We accept the following image formats: jpgs, png. Our maximum file size is 300 mb. What print surface options are available ? Prints are available with Matte or Glossy finish. What sizes Prints come with the Standoff Posts ? Standoff Post are available for sizes 20"x20" and above. Do I have to put the standoff posts on myself or does it arrive assembled ? Our Metal Prints arrives pre-assembled with the post attached to the metal print however you will need remove the post to mount your print on the wall. Mounting instructions will be included in your shippment. How do I hang a metal print on the wall ? Two options are standard, a wood block fixture is attached to the back for easy hanging vertically or horizontally. For larger sized prints, a sturdy plastic frames is mounted on the back for easy hanging. Also offered as an upgrade are stainless steel corner posts for prints 20"x20" and above. Are the surfaces reflective ? All metal prints comes with a glossy finish for stunning look. What do I do if there is an issue with my metal prints ? What do I do if there is an issue with my canvases ? What sizes are available with easel backs ? Easel back canvases are available in 5"x7", 7"x5", 8"x10", 10"x8"
Are the canvases coated ? Yes, a specialized base coat protects the canvas and allows for easy cleaning. May I choose which images are uploaded ? You will need your Instagram user id and password. They are not insulated, but are double-walled. There is a plastic insert that goes in the metal sleeve and then screws together at the bottom to secure the unit..
Is the plastic insert BPA free? Yes, they are BPA free. Does the image wrap around the entire tumbler? 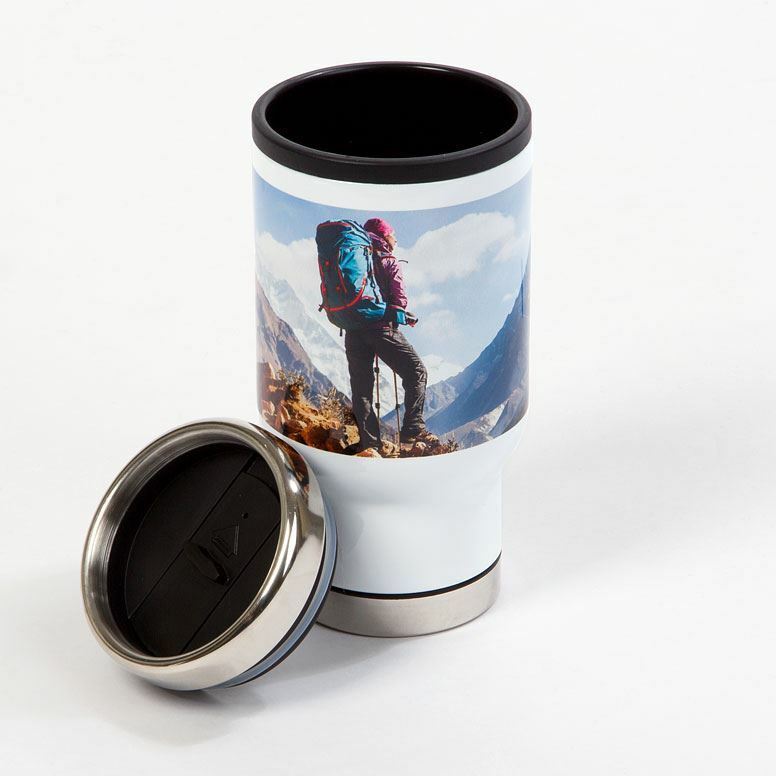 On the full single image and two image designs, there is a gap on the back of tumbler; the image does not meet. For the centered image, it has a larger gap. Are the mugs dishwasher and microwave safe? Yes, they are dishwasher and microwave safe. We offer photo-editing tools, templates, storage, and a simplified creative process that allows you to create fun products to inspire and help you transform moments into memories. © 2019 snap2finish.com - youngevity international ALL RIGHTS RESERVED.